Have trouble relaxing before bedtime? It’s definitely a great idea to detox your mind and body before going to bed to optimize not just how much, but what type of rest you’re getting. A super simple way to detox and prepare for bedtime is by using these easy sound healing techniques that allow your mind and body to decompress and relax before bedtime, and wake up ready to take on the day. 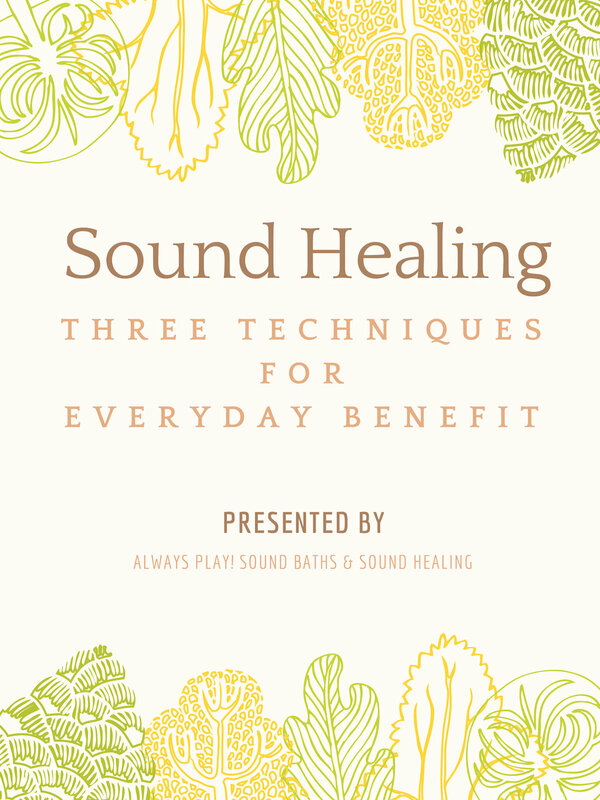 Sound Healing is an ancient form of healing that works to align our mind, body, and spirit. Cultures all through the world use some form of sound healing - like chanting, signing, instruments, and much more. Sound works in two ways with us: FREQUENCIES and VIBRATIONS. The FREQUENCIES impact our brain waves, helping us get to certain calming states, including meditation. The VIBRATIONS impact our physical body, allowing the water and cells in our bodies to act as sound resonators and realign. Simple practices of sound healing can help promote self-care, reduce stress, reduce anxiousness, and help meditation, especially before bedtime. 1) Your VOICE is a powerful tool. a. Rest one hand on your throat. b. Rest another hand on your chest or lower ribs. c. Pick a sound or mantra that you like. Stick to "OM" if you're having difficulty choosing. d. With your eyes closed, take a deep inhale into your belly and exhale as you chant your mantra. e. Repeat at least 3 times or for 5-10 minutes. a. As you mindfully place your hands and chant, your mind is not able to focus on the 100 things on your to-do list, or other worries. You're allowing yourself to be detracted from the same constant thoughts that cloud your cognitive space. b. As the vibrations from your voice travel through your body, they interact with tissues and cells that are also vibrating. As your voice and body's vibrations begin to sync, you're left feeling more aligned. Hey, cats purr for a reason! c. Breathing deeply allows a flow of oxygen to enter your brain while exhaling with a chant allows a physical and verbal release. The tensions the body harnesses are slowly softened through prolonged practice. 2) A simple Tibetan Singing Bowl by the bedside can make a world's difference in relaxation. a. Pick a small - medium sized singing bowl that you can keep by your bedside, or carry with you. b. Hold the bowl with your hands flat, without touching the sides. c. Gently strike the bowl with the mallet and let the sounds resonate. You can try playing the bowl with the mallet as well. d. Take time to do this for a few minutes in the morning and during bedtime. You can carry the bowl with you in a backpack during the day as well. a. The sounds from Tibetan Bowls are attuned to certain frequencies that help our minds reach relaxation. The sounds sometimes cannot be made sense by our minds, and therefore it quiets down. b. This mindful time that you take away to do this activity is a form of meditation and self-care in itself. Listen to music you like - duh! a. Pick a song that elicits happy feelings and good times. c. Do this as many times as you want! a. Activating happy memories helps our brain to get into a loop called a "positive pathway". You know how things in motion tends to stay in motion? That's the same with our thoughts. When we activate positive loops, our minds have the ability to get on board. b. Music also helps our brain release dopamine, a natural chemical that helps us feel good. It's vital to the functioning of our central nervous system and impacts our mind, body, and spirit. And that’s it! Download a free guide below to keep the techniques handy.